Now that the tourist season has finished, it’s also time for me to take a plane homewards. After I check-in and walk towards the gate, the check-in clerk calls me back and asks me to take my suitcase. Oops, I forgot. You have to move your suitcase yourself to a scanner about ten metres further along. That is the way they do it on Lesbos. The flight is going well. When I look out of the window just before landing, I already know that I will miss Lesbos. If you had to judge a culture of a land and its inhabitants from the sky, I would think the Netherlands and the Dutch are pretty tight and rectilinear. All parcels of land are properly demarcated by fences or ditches. The roads are at right-angles, as are the canals and even the cows seem aligned in the same direction. I am back into a country where everything is organized and regulated. A country where, for ten years now, a discussion has been going on about whether an ambulance should arrive within fifteen or thirty minutes. A country where people receive financial compensation, if for part of the day they are without electricity. A country where people of a district protest against the arrival of another big supermarket. A country where dogs are no longer allowed in parks, lest a playing child steps into a turd. And it even gets more crazy: on my return to the centre of the city there appeared bicycle coaches who have been appointed to ‘advise’ me where I can park my bike. What a change from Lesbos! Where the landscape is overwhelming: all mountains, a chestnut forest, pine trees and olive groves; it is beyond me how the Lesvorians can have built any roads at all. Driving along the roads, it is swinging through one curve after the other. 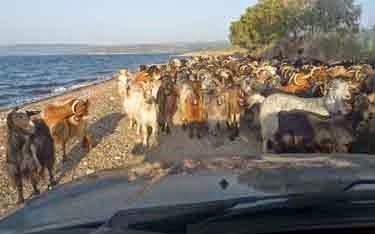 Sometimes you get stopped by goats roaming freely over the road — or a stoic donkey, crossing snakes, foxes, dogs and cats, or a shepherd with his flock of sheep. On spotting their little piles of dung, you can trace where they crossed the road. The only hospital is in the capital, in the southeast of the island. When being in the North or West and there is an emergency, you’d better drive the person in your car in the direction of the hospital, so that an ambulance can take-over midway. The only Lidl (big chain supermarket) on the island is also in the capital and in the mini-supermarkets elsewhere food stuff – much of it bought at Lidl – are relatively expensive. And you cannot always be sure of warm water, electricity or a good internet connection. Despite these geographical and logistic inconveniences, life on Lesbos is relaxed and good. I am pretty amazed by how good everything works and how often you do have warm water, electricity and internet. The shops are well provided. Cars and scooters may be parked criss-cross - where they should or not - but its place measured on the centimetre. Large vehicles like vans or buses always manage to just squeeze by. Bus drivers are real steering artists. I seldom saw collisions. You best be prepared for a little patience when travelling by public transport. It can happen, as I once witnessed, that the driver takes a detour through a village in order to pick up a tin of olive oil or to fill-up at a gas station. But in the end you will always arrive where you want to go. As a big city habitant, who barely knows my neighbours, I love the friendly and helpful people on the island. Because I was not prepared for a cold spring, someone gave me a warm blanket, another person a woollen waistcoat. When I had parked my scooter a little clumsy on a slope and I was unable to get it off its stand, I was helped by a shaky old man, who could barely keep to his feet. When I was unable to start my scooter, there always appeared a boy to do the job for me. When I was stung by a wasp, out of nowhere, there appeared a lady with some ointment. When I decided to walk, cars always stopped to offer a ride. Due to a minimum of physical exercise and the many invitations to join a Greek dinner party on a terrace, my body shows off how good life was for me on Lesbos. People take care of each other; crowdfunding to help people out is pretty normal. And it is admirable to see how many animal lovers take care of the street dogs and cats. Now back into my hectic ‘normal’ life, I might be a danger of idealizing Lesbos too much. Let’s be honest: life there is not always, nor for everybody that easy, especially in the winter, when a large number of the islanders are without work. And the fact that within an hour, half of them know where you have been, what you did and with whom, can also be annoying. But for me I consider Lesbos as a pearl in the Aegean Sea that has to be cherished. New developments, like the much discussed and criticized tourist train that runs between Molyvos and Anaxos, will do no harm. When in the Netherlands you sit in a train full of sulky commuters or are stuck in a traffic jam with reared motorists, it is hard to imagine that people could have problems with this slow going train full of merry tourists. Or am I mistaken? This is my last column about my personal experiences and meanings about life on Lesbos. I enjoyed writing them. Without any scientific substantiation, my wish was to inform, amuse, tickle and provoke a discussion. For some the subjects were recognisable, for others amusing and for some it hurt a little. Thank you for reading and all your reactions. My special thanks are for Julie for having made a place in her blog for me. I wish you all a good winter! Already planning your trip to Lesvos island? Rent a car from Economy car hires, as the first step toward to an ideal holiday.